Ricardian equivalence is the idea that if we cut taxes now in order to boost the economy then this doesn’t make any difference – people will just save to pay the taxes they know will rise in the future. For this to work we’ve got to show that people respond to future tax rises. Which, it appears, they do. The period of low demand and low interest rates during the Great Recession has prompted economists to consider new policies to stabilise the business cycle. The ‘zero lower bound’ on nominal interest rates prevented the use of interest rate reductions to stimulate consumption and investment in many developed economies. Researchers have proposed an alternative policy tool, ‘unconventional’ fiscal policy. This is a commitment to raise consumption taxes in the future (Feldstein 2002, Hall 2011, Correia et al. 2013). Anticipation of higher consumption taxes can incentivise intertemporal substitution in the same way as traditional monetary policy, by raising the price of future consumption relative to current consumption. Households expecting higher future taxes move consumption to the present, increasing current demand. Intertemporal substitution would not take place if consumers are inattentive and so are not aware of future tax changes. Recent research also argues that sales taxes are not fully salient (Chetty et al. 2009). Intertemporal substitution may also be diminished by financial frictions, since households need wealth or credit access to shift future expenditure to the present. Both credit access and wealth typically decline during recessions when unconventional fiscal policy might be most warranted. We do not know whether demand elasticities change over the business cycle in a manner that that would reduce consumer responses (Gordon et al. 2013, Berger and Vavra 2015). The effect of an unconventional fiscal policy may be too small and short-lived to be used as an effective countercyclical policy tool. We attempted to evaluate these issues so that we could understand the effectiveness of unconventional fiscal policy by analysing how vehicle purchases have responded to preannounced state sales tax changes in the US between 1999 and 2017. We chose to focus on vehicle purchases because large durable purchases are long-lasting goods whose purchase can be substantially shifted across time without outsized variation in consumption. In particular, we utilise high-frequency data around 57 changes in state sales tax rates alongside vehicle loan data from the FRBNY/Equifax Consumer Credit Panel (CCP). Are sales tax changes sufficiently salient? If consumers pay little attention to future sales tax changes, they will naturally respond too little for unconventional fiscal policy to be effective. In previous research (Baker et al. 2018) we have shown that both news coverage of, and Google searches about, sales tax changes increase substantially in the months before tax rates change. 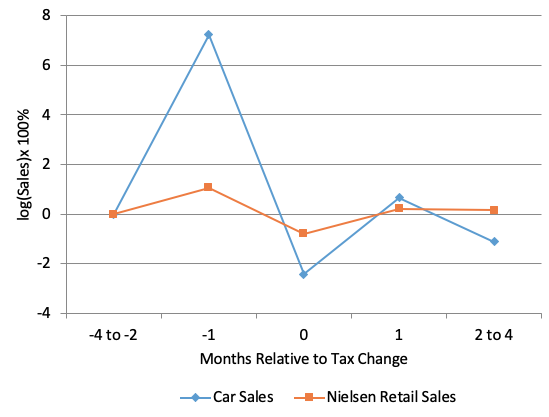 Consistent with this increase in attention and news, we found that sales tax changes provoke large responses in vehicle purchases. Looking at the month prior to a sales tax increase relative to the month following the change, we estimate an elasticity of vehicle purchasing of approximately eight. That is, for a 1% increase in sales taxes, we find that vehicle purchases decline by about 8%. Most of this is just intertemporal substitution, with consumers pulling forward vehicle purchases from the month of the change (month t) to the month prior to the sales tax change (month t-1), as seen in Figure 1. Source: Authors’ calculations based on FRBNY Consumer Credit Panel/Equifax and Census Bureau/Haver Analyticsdata. This effect is short-lived. In the months t+1 onwards, vehicle sales return to their previous trend. In addition, this effect is not limited to tax increases, but we see a similar response, though in the opposite direction, following tax decreases. We find the same pattern, regardless of how the purchase was financed. Non-financed sales, financed sales, and leases all increase one month before a tax increase, decrease immediately after the increase, and return to previous levels one month after the tax rate change. New car purchases respond more to sales tax changes than used car purchases. Therefore, sales tax policy affects the level and timing of vehicle production as well as the timing of trades in the existing vehicle stock. We found a large response to tax increases in our sample of car purchases. But the times at which we would likely wish to use unconventional fiscal policy may also be time at which there are credit frictions, dampening the purchasing response for large durables. To investigate this possibility, we look at the response for each quintile of the Equifax Risk Score distribution using CCP Data. Note that the first quintile denotes the largest credit risks, and the fifth quintile denotes the lowest risk group. Car sales exhibit the same qualitative pattern across all quintiles, but the highest two quintiles are nearly twice as responsive as the bottom quintile. Households with higher credit risk scores (meaning lower credit risk) are more easily able to obtain the financing needed to purchase a car a month earlier than they would have if taxes were not about to change. This suggests that there are significant distributional effects across households. Those with a higher credit risk score make up a greater proportion of car sales in the month before a tax increase. We also directly test whether the responsiveness of vehicle sales tends to be reduced during recessions. Given that credit frictions are higher in recessions, and we find a smaller response among those with least access to credit, the response ought to be weaker during recessions. But we find an elasticity during recessions that is more than twice as large as at other times. A larger response during recessions suggests that there are other factors which more than offset the dampening effect of credit restrictions. Households may be more sensitive to price changes during recessions. They take note and want to take advantage of an upcoming price increase, driving more households to shift purchases. For instance, credit scores are higher in the month before a tax increase than the month after, suggesting that high-credit-risk-score buyers are more likely to take advantage of purchasing before a sales tax increase than low-credit-risk-score buyers. This effect is stronger during recessions. Richer, more credit-worthy, and more sophisticated car buyers appear to respond most strongly, and such households are particularly sensitive during recessions. Similarly, recessions seem to affect the attention we pay to news about sales tax rate changes. Building on prior work by Baker et al. (2018), we show that Google searches containing the term ‘sales tax’ increase substantially in the month before, and month of, a tax change, and this change is particularly large during recessions. News coverage also increases before a tax change, but there is no differential increase in coverage during recessions. These results, consistent with the findings of Gordon et al. (2013), suggest that households may be more sensitive to price changes during recessions, and that households make more effort to take advantage of lower prices if they can. Although credit frictions may exist, unconventional fiscal policy could still achieve significant results due to composition and sensitivity differences of households during recessionary periods. The sales tax changes that we observe induce substitution over a very short horizon, in this case one to two months. In our sample, the incremental purchases in advance of tax increases fully reverse in the two months following the tax changes. So an effect of this size would likely be too short-lived to be relevant for countercyclical policy, in practice. However, the sales tax changes in our sample were small – typically between 0.5 percentage points and 1 percentage point – leading to small monetary savings from accelerating purchases. Extrapolating to a 10 percentage-point-increase in sales tax, and using data on the average rates of vehicle depreciation, we estimate that consumers would pull future car purchases forward by 1 to 1.5 years. Form this we conclude that, if conducted on a sufficient scale, unconventional fiscal policy could be a useful tool to conduct countercyclical policy interventions. Some advocates of unconventional fiscal policy suggest a two-pronged approach. On one hand, announce a future sales tax increase, but also create an upfront, offsetting, revenue-neutral, tax rebate for households. Given that we find credit constraints to be one limiting factor of households’ substituting intertemporally, such a policy would boost the effectiveness of the tax change. Authors’ note: The views expressed do not necessarily reflect the views of the Federal Reserve Bank of Chicago or the Federal Reserve System.